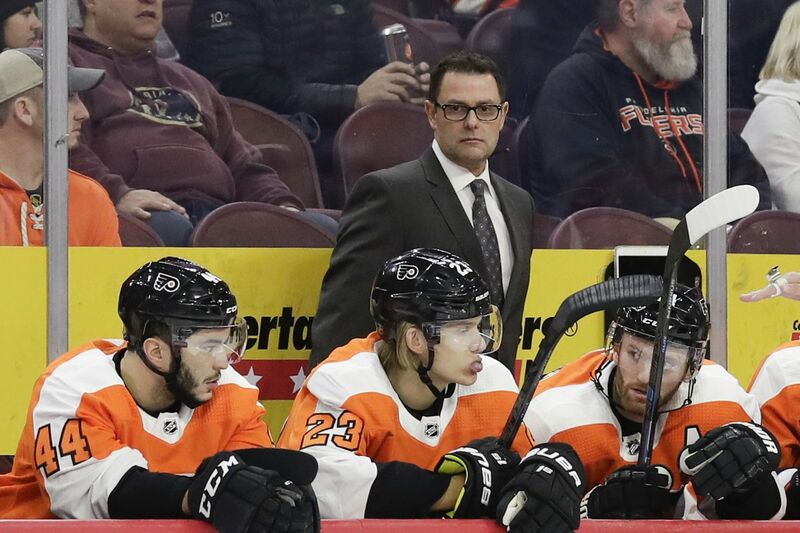 Flyers interim coach Scott Gordon watches the action behind (from left to right) Phil Varone, Oskar Lindblom, and Sean Couturier during a recent game. Scott Gordon, the Flyers’ interim coach, normally addresses his team the morning after a game. Not Wednesday, a day after a devastating 3-1 loss to Montreal, one of the teams they need to pass to earn a playoff spot. “We’ve played a lot of hockey here … and sometimes it’s good not to watch any video and not to hear the coach barking and telling you what you did wrong and what you need to do better,” Gordon said after an optional skate Wednesday attended by seven players in Voorhees. “This is just a chance for the guys to get in a light workout today and if they need treatments, get treatments. The Flyers, who play Thursday in Chicago, are coming off a stretch in which they had four games in six nights. Three of the games were in four nights. The Flyers looked like a tired team in Tuesday’s loss to the speedier Canadiens. The Flyers are six points out of the final playoff spot with nine games left. It’s seven points if the tiebreaker (regulation and overtime wins) is used. Carter Hart, who has a 2.73 goals-against average and .919 save percentage, will start Thursday’s game. ... In an NHL players poll, 69.4 percent named Gritty the best mascot in the league. … Hartman will return to Chicago, where he once played for the Blackhawks and where he lives in the summer. His dad owns a sports bar in the Chicago suburbs. … Justin Bailey, the human yo-yo, was again sent back to the Phantoms. He was recalled Tuesday in case Travis Konecny, who was feeling ill early in the day, wasn’t able to play against Montreal. Konecny played and Bailey was a healthy scratch. … The Flyers had players at the net 53 times against Montreal, Gordon said after watching the video. That said, goalie Carey Price didn’t have to face more than a couple of dangerous shots in front.